One of the things I love about working at KaiNexus is how much joy we each take in the successes of our customers. I can't tell you how many times I've gotten a call, text, or email from someone on our team who logged into a customer account to check on something and discovered an improvement with an astronomically high impact, a ridiculously successful engagement rate, or a steep improvement curve. We're all constantly reveling in the cool things our customers are accomplishing. One of the impacts KaiNexus has on these organizations is that they see a massive increase in the number - and quality - of improvements that they're able to implement once they roll out KaiNexus. We've spent years studying how and why introducing technology has such a startling impact on implementation rates, and recently asked some customers to share the impact KaiNexus has had on the implementation of improvements in their organizations. Before [KaiNexus], we didn't have a system; we worked off Excel spreadsheets. The whole company's filled with Excel spreadsheets. The thing about those, they sit to the side. You have to email them to someone. With KaiNexus, we've actually taken the spreadsheets, we've uploaded them into the system, and now... we've got people that can see all the ideas. We can manage to them. We can implement them, so it's definitely allowed us to implement far more ideas than those Excel spreadsheets just sitting there. This is a pretty common reaction to rolling out KaiNeus in an organization that has historically relied on Excel spreadsheets. We've written a lot about why spreadsheets fail to spread improvement. Our customers implement an average of 75% of the opportunities for improvement they capture - which is significantly more than the average suggestion box, with an average implementation rate of less than 5%. Chances are your implementation rate falls somewhere between these two extremes. What we did see a big increase in was the percentage that were actually submitted within a certain time frame, so our completion rate of those improvements has dramatically gone up. Again, this is feedback we get a lot. If you had to guess, how many improvements and projects would you guess are gathering dust in the recesses of someone's To Do list in your organization? These stalled improvement will likely never come to fruition, as the older they become, the less relevant they are and more backtracking will have to be done to get them up-to-date. Every day that an improvement languishes on a spreadsheet is money left on the table, patients sitting in the waiting room, or defective products in production. 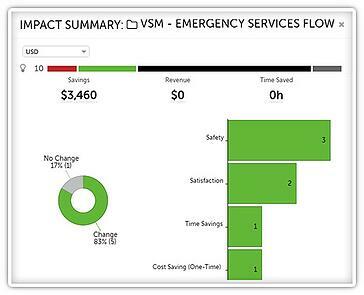 Accelerating the rate at which an improvement flows through the cycle of capture, implement, measure, and share frees up your team to move on to the next project while racking up the impact as they go. Eliminating the need for update meetings, so you can save your meetings for more important collaboration like strategizing and problem-solving. 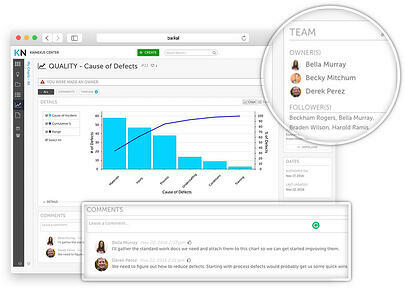 Everyone knows what's going on with their improvements and projects in real-time. Your improvement team has increased visibility into improvement around the organization, allowing them to maximize their time with more meaningful interactions and targeted coaching. Automated alerts remind you when improvements, tasks, and projects are coming due to increase accountability so that everything gets done on time. The speed of adoption of some of the ideas and the improvements is faster. They don't have to go through so many cycles of abandoning things on the PDCA cycle. They can adopt things much more quickly when we can connect them with successful other pilots and implementations. The impact of knowledge sharing in an improvement culture cannot be overstated. Organizations that succeed in establishing a deep-rooted culture of continuous improvement prioritize organizational learning. By that I mean that when an improvement is made in one part of the business, it is quickly propagated throughout all relevant locations and processes, with staff updating standard work and moving forward together to continue to improve that standard. Standardizing the improvement process with customizable templates that match the improvements and projects you're already doing. Get the entire organization on the same page and speaking the same language so that ideas can be easily spread and adopted. Standardizing the resolution process for improvements. 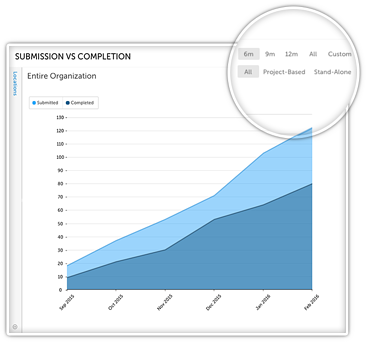 When an improvement or project is completed in KaiNexus, staff enter the outcome of their work (which leadership then has the option to approve). In this way, you can ensure that the process and impact of every change initiative is documented. Broadcasting completed improvement. As part of the standardized resolution process, staff and leaders have the option to select with whom they'd like to share the improvements. The information is then broadcast to all selected areas so that others can see, evaluate, and adopt the change.